A few short months ago I had started playing 40K again. I had been on hiatus for several years but was never far. My homepage was always honed in on the GW site so I was always in the know when something new was coming out. Well in those short months I have also teamed up with MikeD at our local store. I have been learning the ins and outs of 5th edition and getting my space legs back. I have come to the realization now that I need to re-vamp my entire Chaos army. I played a pure Slaaneshi army in 4th edition. The most obvious changes were how the daemons were used, then the loss of gifts of chaos for vehicles/units and lastly the Chaos god alignment restriction was lifted. This last part means that now Khorne and Slaanesh troop units can fight side by side. This was not always the case for I have not forgotten Skalathrax!!!!! So what is a Chaos Lord to do.....raise an army of course!! I have thought about being rid of the daemon units all together but have reconsidered for the simple fact that tactically there are few units that can deep strike and assault in the same turn. The sole purpose of this tactic would be to tie your enemy up fast enough to get the rest of the army into place. Secondly I needed a base force to work with that would tie in all of the Chaos powers together. My search led me to the Relictors. Their background and fluff are ideal for a Chaos war band. I absolutely love the "Are they loyal" or "Are they traitor" aspect and that is why this hobby rocks!! You have the freedom to do what you like and complete the story because the answer is never going to be revealed by GW. This is how I see it remember if you are a loyalist Relictor War General "do not" I repeat "do not go any further" you can't handle the taint! Let's start in the beginning with Torva Minoris their Home World. This planet was known to be shrouded in intense warp storms during the Chapter's founding years. 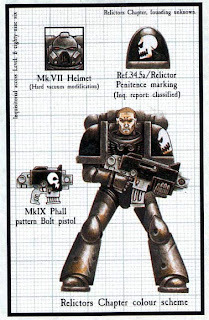 Secondly the gene stock is said to be derived from both Ultramarines and Dark Angels, enough said on the later part. It is known that they were originally called the Fire Claws but were renamed the Relictors when they stumbled upon a space hulk and encountered their first daemon weapon which they used to kill it's master. From this point forward they were hell bent on finding more artifacts of Chaos to use against them. Word got around about them using weapons of Chaos and they were asked to turn them over to the Inquisition or be destroyed. They chose life and were sentenced to serve a 100 year penance crusade in addition they forfeit the right to recruit initiates. This crusade did not last very long however and the Relictors were back to their old tricks and were all consumed with finding Chaos relics. They defied major players in both the Battle for Armageddon and the 13th Black Crusade. They even attacked an Inquisitor to reclaim an artifact. Their behavior almost wrought their destruction. They were attacked by four chapters of Grey Knights and were reduced to a paltry 200 or so marines. They sought refuge in the only place they knew....the Eye of Terror. This is where the fluff ends. So some decades have passed and no one has seen or heard from the Relictors til now......we all know and fear the power of the warp, just how long can one survive in it without being touched by the dark powers or hear the voices that whisper secrets that no man should know? I believe it is here that the Relictors have taken the final plunge into Chaos. Oh Yeah! They still believe they are fighting the good fight but they are not. They have become a shell of there former selves, battered and bruised, they have become debased stripped of their Home World, the loss of their star fortress and the inability to strengthen their numbers. They have only one option and that is to recruit from within, sure they have value to the Chaos gods because they have knowledge of the Imperial forces and they are not exactly emotionally stable due to prolonged exposure from the warp, they are just ripe for the picking if you ask me. Their appearance on the battle field would have to be rough and rugged, beat down and battered. Long hair, nothing militarily uniform and where only the strong survive. The leaders that were part of the Conclave would consist of Chaplains and Librarians. 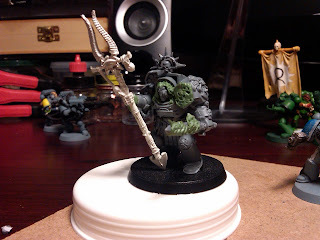 Obviously the Librarian model would substitute for the Chaos Sorcerer and the Chaplains could become Chaos lords or champions even a sect of terminators. This brings us to the modeling section: Please keep in mind that this is a work in progress. 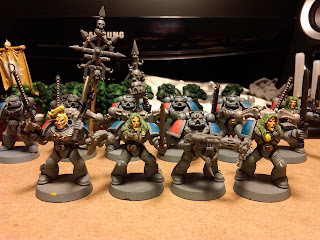 I hope to be done with them in the next week or so all painted and ready to go to war. I have started with a group of Chosen with a Khorne banner. The models will need to be primed and painted. 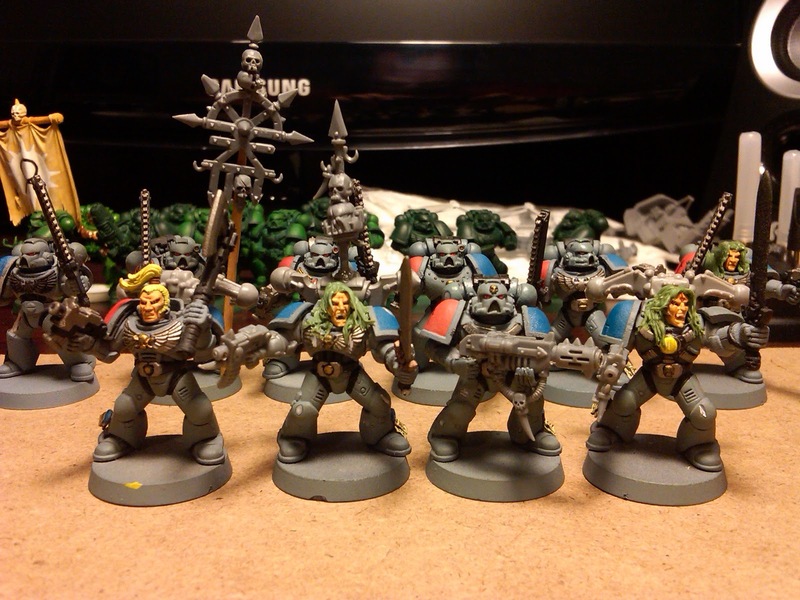 I salvaged this group from some old Space Wolves that I had laying around in the garage. They worked out great for the Chosen because they had exposed heads from which I could add hair and give them the look I wanted. I hope this inspires someone to step out above the crowd to create a vision and make it happen. Thanks for stopping by....Lord Castillo. Thing a Day: 3/8 - 3/15 I've Been a Busy Bee!! Thing a Day 3/1-3/7 March is on!